On sale at almost 50% off!! 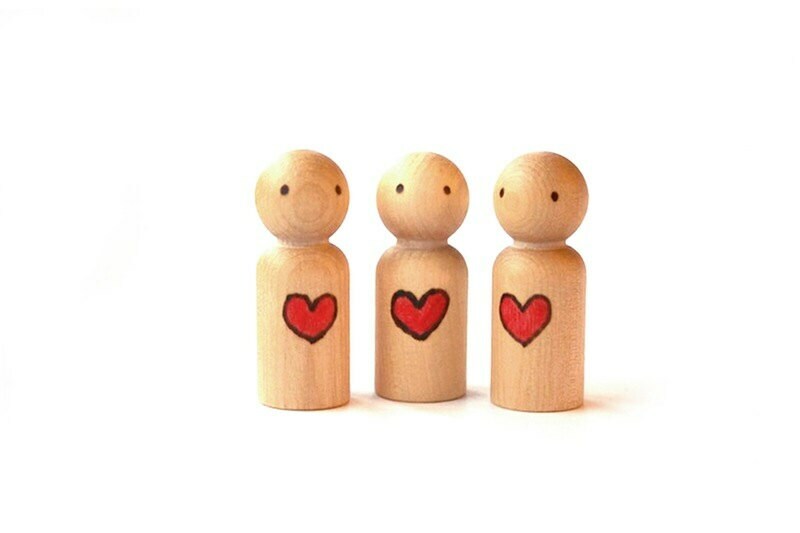 Made from 100% American Birch, our peg people will win the heart of your children. This little guy is happy to share his heart with everyone. His heart and eyes are first wood burned. Then his heart is hand painted with a non toxic color wash. Finally he is sealed with our homemade local beeswax polish. All of our wooden toys are made with the most care and love to give your child a safe, natural toy. The toys are color washed using AP approved toxic-free watercolors. Our wooden toys are sealed with our homemade, all natural, local, organic beeswax sealer. All of our painted toys are not recommended for children who put objects in their mouth and should not get wet. Our unpainted toys are perfect for these younger children! We ship all of our toys via USPS First Class mail. The average shipping time in the US is 3-5 business days and outside of the US is 1-3 weeks. All US orders will receive a shipping notification and tracking number for your package upon shipment. Outside of the US will receive a shipping notification email and an estimate of arrival date. If you need faster shipping, please contact us for a quote. Looking for a toy or felt set we don't have? Send us a message and we would be happy to create a custom order for you, free of charge! All Cake in the Morn toys come wrapped, ready to give as a present! No need to pay for extra gift wrap! DIY Solid Wood Peg Rack 12" x 3.5"